If when booting Windows 10 the automatic disk check (with chkdsk utility) takes place, a user doesn’t see the results of this check. How to get access to the log with disk check results? In Windows 7 and earlier Windows versions the detailed information about chkdsk actions was displayed directly on the boot screen. 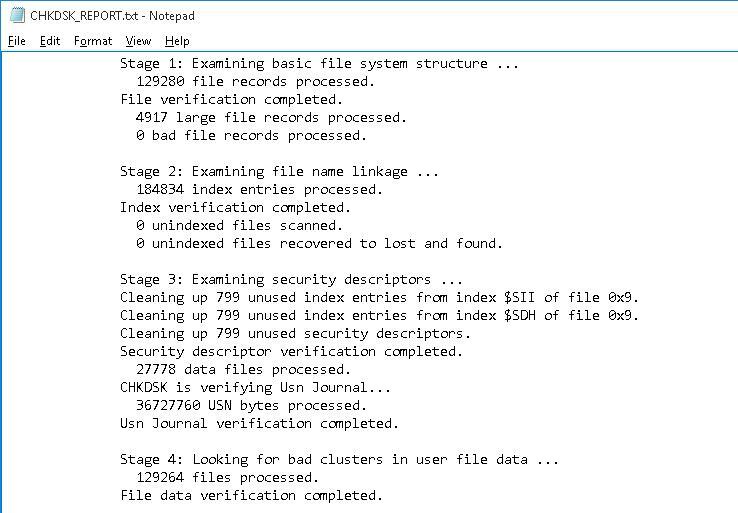 In Windows 10 and Windows 8 the developers removed the detailed chkdsk log and only display the total progress of completion. An experienced user or an administrator may sometimes need the information about the corrected mistakes and changes made to the file system. 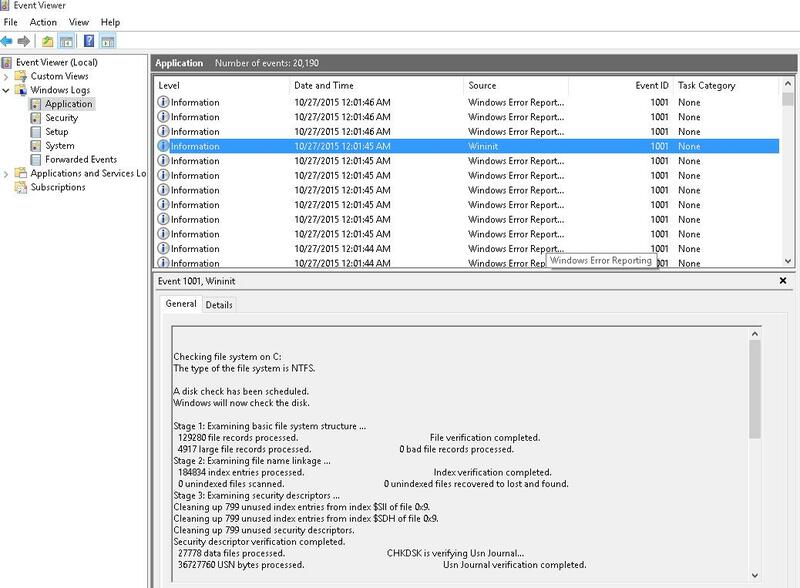 In Windows 10 / 8 you can look through the results of the automatic hard disk check only in Windows Event Viewer. 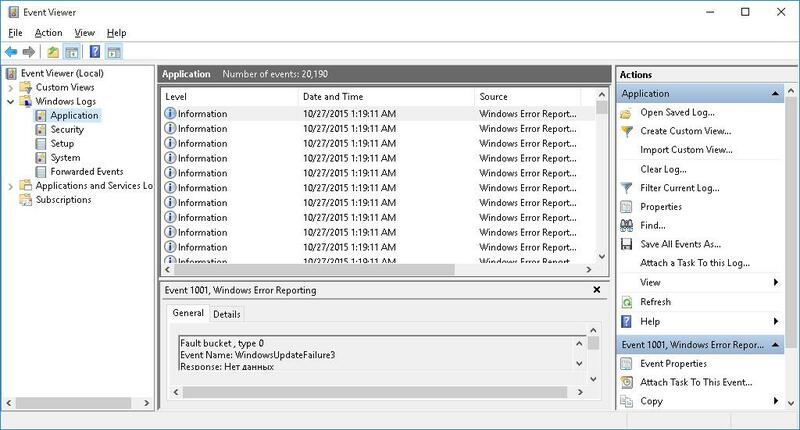 Open Windows Event Viewer by typing event in the search bar and select Event Viewer application. In the next window, go to Windows Logs -> Application. Right-click Application and select Find in the menu. 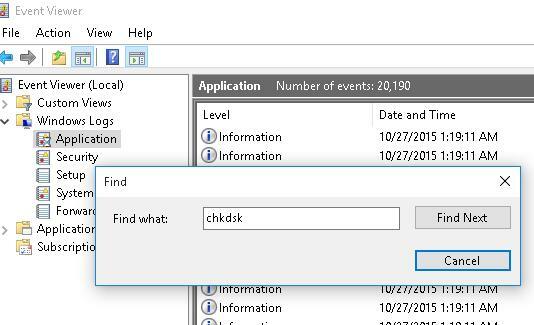 In the search bar, type chkdsk and click Find next. The first found event with the Event ID 1001 and the source Wininit has to be displayed. In the General tab, a detailed log with the results of the latest disk check will be shown. 122280 file records processed. File verification completed. 4817 large file records processed. 0 bad file records processed. 184654 index entries processed. Index verification completed. Cleaning up 788 unused index entries from index $SII of file 0x9. Cleaning up 788 unused index entries from index $SDH of file 0x9. Cleaning up 788 unused security descriptors. 36724460 USN bytes processed. Usn Journal verification completed. 12280 files processed. File data verification completed. 6433211 free clusters processed. Free space verification is complete. 41423341 KB total disk space. 15155466 KB in 90632 files. 75328 KB in 27779 indexes. 55762 KB occupied by the log file. 25979887 KB available on disk. 10354722 total allocation units on disk. 6493022 allocation units available on disk. The same file can be obtained using the PowerShell command that exports the information from the event log and saves it as a text file CHKDSK_SCAN.txt. This file can be opened in any text editor. So we have got the disk check log performed during startup.